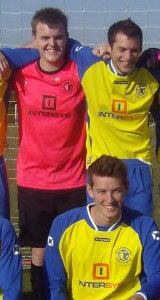 Intersys® Provide Hertfordshire Rangers FC With a Fab New Football Kit! Intersys® have recently become sponsors and Club Partners of Hertfordshire Rangers Football Club and have provided the team with a fantastic new football kit! The new incarnation of the Rangers team was kicked off in May 2008 by two close friends (and a little help) with an enthusiam that will no doubt see them adding to the rich history of football in the area. Their first goal as a new club came in the 1-1 draw against Thorley Park on the 29th August 2008 scored by Mark Barrow, and their first League game win on the 13th Sept 2008 when they beat Albury FC 3-2 (with Rick Jones scoring their first competitive goal). 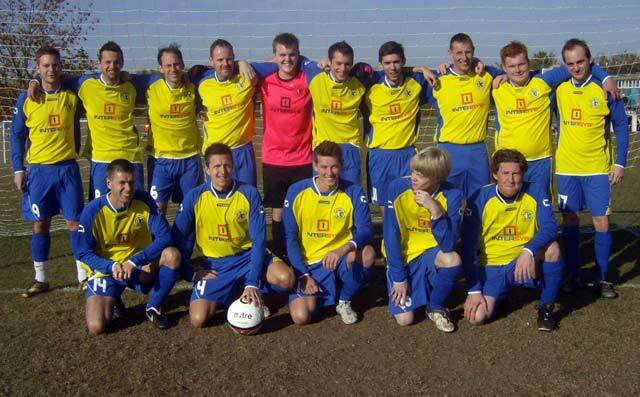 Their first hat-trick was against Potter Street, and came on October 5th 2008 via the ever talented Matt Wright. The following month they devoured Lower Street in a 7-1 crushing victory, 4 goals coming from Mark Barrow alone. Rangers topped off their first season on a high with a 4-2 away victory over Avondale Rangers, finishing the season in 8th position. Hertfordshire Rangers started the 2009/10 season with a new manager, Pat Dee, and continued to score impessively with consecutive hat-tricks from Matt Wright, and 4 goals in a match by Ian Bees to beat Lower Street 6-2, and notching up an 8-3 win against Potter Street to give them their best single match score to-date. Their first Cup Final appearance came against Stortford FC on 27th March 2010 where they lost 3-0, though this was not to stop them from receiving promotion to the First division in May the same year! Hertfordshire Rangers have been award winners for the the last 2 seasons, and continue to grow from strength to strength as the club develops. Congratulations from all at Intersys®, and wishing the club every success for the coming season. The new Hertfordshire Rangers are not to be confused with the old team of the same name that gained Football Association recognition way back in 1866. This original Hertfordshire team have since become Watford FC. In their early incarnation they were a dominant force in Hertfordshire and featured in the FA Cup from 1875 through to 1881. The original team consisted of players mainly from the local Aldenham School, Elstree School, and Cambridge University, but the club folded in 1882 as key players left school and relocated to follow their University paths.